The aging process is a natural part of life that everyone undergoes. It is a process of change. As we age our bodies' show this change in various ways: in our hair color, skin changes, muscle tone, and in a slowing and weakening of bodily functions. Advancing age may also bring about subtle changes in memory as well. Dementia is the loss of intellectual abilities (such as thinking, remembering, and reasoning) of sufficient severity to interfere with a person's daily functioning. The most common form of dementia is Alzheimer's disease. Alzheimer's disease is a progressive, degenerative disorder that affects tissues in the brain, eventually resulting in abnormal brain function. In 1907 Alois Alzheimer, a German physician, first described the abnormal changes in the brain now associated with Alzheimer's disease. As there are more than 50 diseases that can cause dementia or symptoms similar to Alzheimer's disease, a thorough medical evaluation is needed. Currently there are no definitive tests that can be done to diagnose Alzheimer's disease, rather a series of tests are conducted to rule out other causes of dementia that may be treatable. There are several cognitive tests that can be done that are about 90% accurate in identifying people who have very mild dementia. New advances in MRI testing also help detect early onset of Alzheimer's and may someday be able to predict the disease before a person ever experiences the first subtle confusion. Recently researchers have been experimenting with blood testing such as Presenilin, which can identify an early onset gene, and AOE which can tell you if you are high or low risk for contracting Alzheimer's disease. Even though a diagnosis may be hard to accept, for some it may come as a relief. The ability to identify a particular physical disease may allow the patient and the caregiver to better understand and respond to the changes that they are seeing. Early diagnosis can be devastating to those who have the capacity to understand the meaning of their diagnosis, but can help equip those involved to understand the disease process and make appropriate plans for their care. With the progression of Alzheimer's disease or other dementia, the patient may become increasingly dependant upon the caregiver for even the most basic tasks. 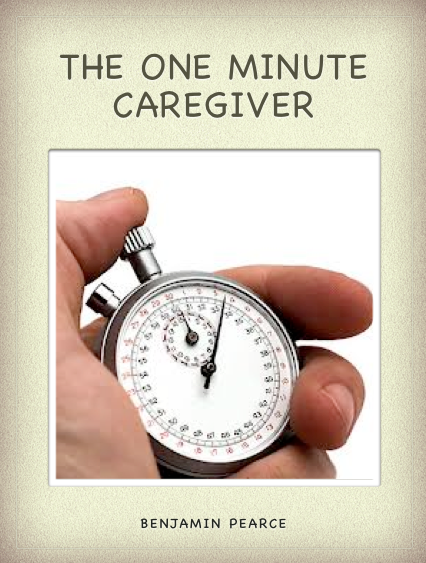 Daily activities once performed routinely may require assistance or supervision by the caregiver. The caregiver may eventually need to reconsider the range of acceptable activities for the patient as their impairment progresses. The management of financial affairs, and previously safe activities such as driving and preparing meals, taking medications or going for unaccompanied walks may become hazardous. In later stages of the disease matters such as daily hygiene and dressing may be beyond the capabilities of the patient and will become the caregiver's responsibility. Short-term memory loss is normally the first symptom noticed. Patients become forgetful, lose things and have trouble remembering most recent events. Establish a routine and provide a written daily agenda such as notes or a special calendar. Leave items in plain view that are used daily such as hearing aides, glasses so that they can take advantage of visual cues. Avoid questions that test their memory such as "What did you eat for breakfast?" or "Didn't you pay the credit card bill?" these serve only to make them more painfully aware of their loss. People with dementia often experience word-finding problems, especially when they become fatigued or are emotional. Supply the word if she can't, if they lose their train of thought mid-sentence; tell them that they can come back to it later. Preserving the patient's self-esteem is critical. Some people may have difficulty following instructions or complex concepts. Use short sentences, and visual cues. Never assume that they have understood everything you have just said. Many people will ask the same question repeatedly. This is quite common and indicates that they are trying to remember something that is important to them. Be patient, and answer their question as if it was the first time you heard it. If the information is critical, jot it down for them. Denial is a common coping mechanism and a natural way of self-preservation. If you want someone with dementia to admit that they have it, they need to feel safe, supported, and that they have some control over their future. Resist the temptation to convince them of their condition. They are more likely to respond to emotional support, and opportunities to talk about their fears. Changes in the brains of early stage patients cause impairments in memory, reason and judgment rendering it difficult for them to make decisions. Many feel overwhelmed when asked to make choices, causing them to feel ashamed of their condition. Limit situations where choices are necessary. Paranoia, common in the disease, results from damage to the part of the brain that separated fact from fiction. It is also a way for the patient to avoid the painful realization that they have Alzheimer's disease. You will not convince an Alzheimer's patient that someone didn't take his wallet, so don't even try. Respond to the feeling behind the paranoia. Help him look around for it. Avoid denying their reality. For many adults, driving represents independence, freedom, competence and control. It is a way to access healthcare, to buy necessities, to be productive and to stay connected to family, friends and the community. Concerns about driving are likely to surface during early stages of dementia, when individuals are still socially engaged and able to manage other daily activities. Giving up driving can be a deeply personal and emotional issue. Disorientation and changes in memory, visual perception and reaction time make driving dangerous for both the patient and everyone else on the road. The family should closely monitor driving abilities, and if they have concerns then they should have their doctor tell them that they can no longer drive. In most states the Department of Motor Vehicles can offer a competency test as well. Open conversations early in the disease about when driving should cease can help smooth the transition to not driving in the future. Newly diagnosed seniors commonly experience depression. Symptoms of this are often associated with withdrawal, crying, agitation, and changes in eating habits or sleeping patterns, feelings of worthlessness or acting out. Depression can significantly lower a persons cogitative capabilities and their ability to fight-off illness. Ultimately this is the single biggest factor that will influence their quality of life. Depression is treatable with antidepressants but the best treatment for depression is socialization. Isolated people with dementia tend to focus on all the things that they can't do anymore, their limitations. But in social situations such as day care or senior living homes their focus becomes directed outward toward their environment. Seniors who can learn to view changes in their life as a process of life rather than an end to it will treat themselves to a happier, healthier life. Families are often concerned that knowing what is causing their loved one's memory loss may trigger them to panic, or become depressed and hasten the degenerative process, while for many the opposite may be true. A patient who is kept in the dark about the source of their problems may tend to worsen because they desperately try to remember things and become frustrated, agitated and possibly depressed when they cannot. They need to know that something is causing the problems that they are experiencing and that it is not normal or a part of getting old. This way they can learn to understand the disease and their prognosis and be more receptive to the adjustments in their changing lifestyle.